Early this spring Jeff pointed out that we had a lot of jars of jelly. They were mostly gifts from friends and family. While I love getting homemade preserves, we just don't eat them that often. Jeff made a couple batches of jam thumbprint cookies, but we still had lots of jam. We needed a healthier option than thumbprint cookies. Then Jeff found a recipe for breakfast cookies. I just used up the last jar of jelly today. I would guess 80% of our jam was used making this breakfast cookie recipe. We make it about every other week. The oats and wheat germ make them wholesome and the pecans and raisins bring lots of flavor to the table. We tried lots of flavors of jelly: persimmons, blueberry, blackberry, and wild grape - all were tasty. The wild grape goes perfectly with the raisins. If you have peach or apricot jam, I could see adding chopped dried apricots instead of raisins. Anyone have a jar of apricot jam they want to give me? At first I wasn't impressed with the breakfast cookies because although they look like cookies, they don't taste like cookies. They aren't sweet. They are more like a granola bar, but that still implies sweet. Breakfast biscuit? No, that sounds like it should be light and fluffy and these are definitely dense. I guess cookie is as good description as any. And who knows, perhaps calling these cookies will entice the reluctant breakfast eater. Just serve them with a cup of coffee or a glass of milk and no one will care what they are called because they are nutty and delicious. Plus they are portable; perfect for eating on the way to school or work. Step 1: Preheat the oven to 350 degrees. Mix all the wet ingredients together in a medium bowl - jelly, oil, honey, and egg. Step 2: In a second bowl whisk together the dry ingredients - flour, baking soda, salt, oats, wheat germ, pecans and raisins if desired. Step 3: Add the wet ingredients to the dry ingredients and mix till combined. This will be a very course dough. Divide the dough into 12 balls and place on a cookie sheet. Use the palm of your hand to flatten the balls until the dough is about 3/4 of an inch thick. These cookies won't spread or rise. Bake for 15 minutes or until the bottoms turn golden brown. Breakfast cookies are wonderful fresh and they store well. 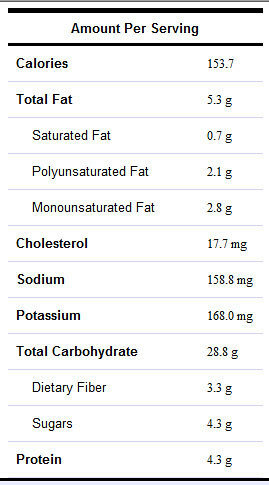 Nutrition for one cookie: 3 Weight Watcher's Points each, 150 calories, 3 grams of fiber, 5 grams of fat and 4 grams of protein. My mother used to make "breakfast cookies" with chocolate chips and lots of butter. Wheat germ sounds better for a grown-up version. What type of jelly goes best with raisins? I was just looking for healthy breakfast options, and your post came up! Thanks for the recipe. Sounds pretty good. I struggle with breakfast. It is the time of day when my sweet tooth bothers me. It's hard to stay on track. This sounds like just enough. I may have to try this. I like it! This post is really very helpful and informative. Thanks a lot for posting it. these look/sound sooooo good! i'm going to try making them as soon as i can! These sound like they would make a great mid-morning snack to ward off hunger! Thanks for sharing :)! Beautiful picture! I like that they are sweetened with honey. For a twist, you may try sweetening with pure maple syrup. I also think that these would make a great mid morning snack instead of my usual fiber or granola bar. Thanks! Looks healthy and wholesome indeed! 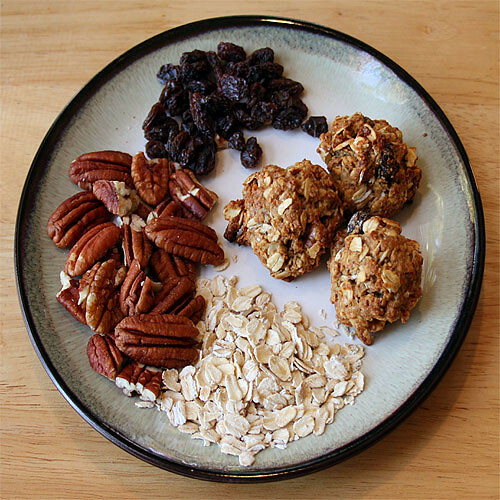 I love this idea of healthy breakfast cookies, an will try these, I might use walnuts instead of pecans, to boost the calcium. Thanks for sharing! I love these! I won't have to feel guilty for eating cookies for breakfast anymore! Wonderful recipe! This would make a great portable breakfast. oh these look delicious- that was so creative! Yummy. It does remind me of granola, but then I can't resist that either ehehehe. These look delicious. I love this kind of baked item. I love granola so I'm sure I would like these. Thanks for posting! Who doesn't like cookies for breakfast, even better if they're healthy! Of course everybody like cookies for breakfast, specially the kids. Breakfast and cookies...I am all in! I love cookies with oatmeal... they even sound healthy. Everyday Southwest is one year old! I want to make sure all my friends from foodbuzz have a personal invitation to join our Birthday give away. Visit our site all month long for chances to win! These look fantastic - must make some for Mr Chiots to take hunting, they would be the perfect snack. I think I might add coconut to them though. I agree, Chiot's Run, I think coconut would be delicious. Just make sure it's not sweetened. That or reduce the honey. Made this tonight and it turned out great! Thanks for the recipe! This sounds like the perfect on the go breakfast food. I have bookmarked this page so I can make these. Thanks for the recipe. Linked to this recipe from another blog, and just had to try them! I made several small changes, and have made similar breakfast cookies, but using jam made them so much better! I still have a dozen jars of apricot jam left from 2 years ago, so this recipe will be used frequently. Just found these...can't wait to try them with the kids for breakfast. Also, have you bothered to re-point on the new WW points plus system? Aah, you changed the recipe!?! I had it memorized and was making them every week. Took a couple weeks off and needed to double check a quantity. Now there is vanilla, 2 eggs......what's the deal? I mean, I do some fudging around with this recipe, it's an awesome one. Just wondered what the basis for your changes was? Funny, my husband informed me I had the recipe wrong recently. He started making the breakfast cookies instead of me and keeps his own recipe files that are much tidier than mine. I couldn't find where I had originally jotted down this recipe so I had no rebuttal to the two eggs. I updated it to his version. Although I think the addition of vanilla was a tweak I did a while back.